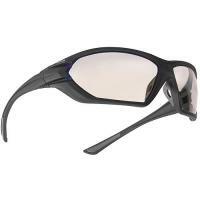 These Bolle 40146 ASSAULT ballistic protection sunglasses are designed to protect your eyes from a range of hazards. Their polycarbonate lenses meet STANAG 2920 impact protection standards as well as EN172. The smoke style cuts out glare for improved visibility in bright conditions, and also protects against UVA and UVB radiation. Platinum anti-scratch and anti-fog coatings applied to each side of the lens keep them clear and undamaged to maintain unrivaled visibility. The lightweight frames are flexible and comfortable to wear. They feature non-slip material at the bridge and temples to prevent them from slipping.